About 69 percent of the country's 1.3 billion people are in prime house-buying age -- 20 to 40 years -- more than any than any other nation, according to a Bloomberg Intelligence report in April. Per capita income has grown at a compound annual growth rate of 10 percent for the past five years, according to CLSA's note in May. When he was little and his father was building his taxi business, Pradeep Yadav lived in a chawl, a rundown tenement in Mumbai. The apartment had one light, a fan and water for just two hours a day. Now he stands at the vanguard of a potential housing boom that brokerage CLSA India Pvt. estimates could reach $1.3 trillion in the next seven years. With their three boys finished university, the family bought a flat in Palava City, a leafy township on the edge of the metropolis. Outside their balcony, tidy footpaths wind their way past manicured gardens and a swimming pool glints in the summer heat. "It was his dream to have something bigger," Yadav, says of his father, now retired. "He didn't realize he would get something like this." The Yadavs are part of a swelling middle class in India that's demanding better housing and increasingly has the means to get it. It remains to be seen whether the country, with its sprawling slums at one end of the housing spectrum and obsession with luxury at the other, can fill the gap but analysts such as CLSA say conditions are ripe for a broad acceleration in residential construction in the $2 trillion economy. "The last decade was about price appreciation," said Pankaj Kapoor, founder of Mumbai-based Liases Foras Real Estate Rating & Research Pvt. "This decade will be about volume growth." Indian real estate, historically a depository for black-market cash, was hit hard by the government's move to stamp out corruption with a ban on high-denomination bank notes in November. The slump is showing signs of a recovery. Sales across nine cities rose 19 percent in the March quarter after a 20 percent slump in the previous three months, according to PropTiger.com, an Indian real estate advisory firm. The demographic arguments for rising home sales in India have been long building. About 69 percent of the country's 1.3 billion people are in prime house-buying age -- 20 to 40 years -- more than any than any other nation, according to a Bloomberg Intelligence report in April. Per capita income has grown at a compound annual growth rate of 10 percent for the past five years, according to CLSA's note in May. The Yadav family is a textbook example of this burgeoning demand. Migrating to Mumbai from Uttar Pradesh, they raised three sons -- Pradeep, 28, an MBA graduate, Birendra, a doctor and Pramod a gemologist. They eventually climbed the property ladder to a rented flat. About three years ago they bought the two-and-half-bedroom apartment in Palava City for about Rs 77 lakh ($116,000), where they all still live together. It's the supply part of the equation that India's had trouble with. The growing migration of people to urban areas has overwhelmed infrastructure, pushed up land costs, and led to housing shortages. Building costs have also risen in recent years and developers have concentrated on the luxury end where margins are fatter. Government funding has largely flowed to the rural sector. But two catalysts have come into play that have put construction at a "tipping point," CLSA's Mumbai-based analyst Mahesh Nandurkar and his colleagues wrote. Prime Minister Narendra Modi broadened reforms this year to foster construction and home buying under his "Housing for All" program, launched in June 2015. That aims to build 20 million urban homes and 30 million rural houses by 2022. Property has also become the most affordable in two decades. Among the reforms: builders of affordable housing received "infrastructure status," making them eligible for state incentives, subsidies, tax benefits and institutional funding; interest-rate waivers and rebates were extended to households with incomes up to 1.8 million rupees and laws to tackle building delays and protect home buyers came into effect on May 1. PM Modi has tapped into the widespread view that as the economy boomed, the property market "became a haven for speculators and investors," making it nearly impossible for middle class people to buy a modest home, said Ashok Malik, who heads the New Delhi-based Observer Research Foundation's neighborhood regional studies initiative. But "an uptick in the jobs market would be necessary for a fully-fledged middle class housing boom," Malik said. "And that remains a risk." Hurdles remain immense. There's still "a big question mark" over whether the government's housing plan is "realistic and implementable," Anuj Puri, chairman of real-estate services at JLL Residential, wrote in a note released on June 5. "It seems impossible if enough land is not released for the creation of affordable housing. Land is a very price-sensitive commodity, and its current shortage in major city-centric areas prevents the development of affordable housing in areas where it is most direly needed." Apart from costs, entrenched bureaucracy makes getting projects off the ground tedious. Once they do, more than 30 percent of projects run at least a year over schedule, according to Liases Foras. Challenges aside, the government's begun to view housing as an "economic enabler", said Abhishek Lodha, 37, managing director of Lodha Group, which is building Palava City and is one of India's biggest property developers. 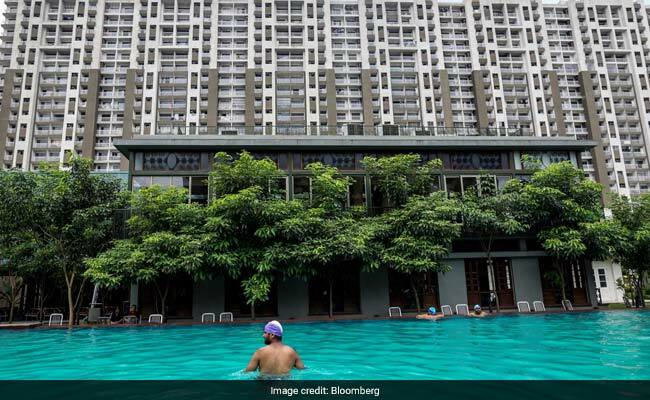 "The government has started recognizing that for the middle class to start creating wealth for themselves they have to participate in housing, just like any democracy," Lodha, said in the company's headquarters in Mumbai. "Property ownership plays a key role in the middle class growing their wealth over time without necessarily having to invest in speculative assets" such as stocks. Since the prime minister's affordable housing incentives were announced, 113,508 homes have been completed and another 755,083 are in progress, said A.A. Rao, ministry of housing and urban poverty alleviation spokesman. "There is a palpable movement forward," in private sector participation, he said. 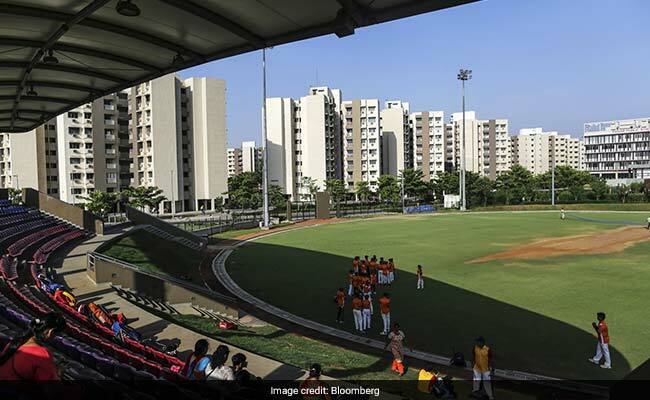 Lodha Group, best known for its luxury developments, has also been steadily building out Palava City on a 4,500-acre (1,821 hectare) tract of land -- about a quarter of the size of metropolitan Mumbai. That's enough space for about 400,000 homes when it's completed in about 40 to 50 years, which would make it one of the world's largest private housing projects, Lodha said. Since construction began in 2009, about 19,000 homes have been delivered, along with a cricket ground, its own fire engines and schools. It also recycles 100 percent of its waste water, uses solar power for street lights and is building a 15-acre solar farm. Other developers are turning toward the affordable sector. Housing Development and Infrastructure Ltd. launched a new Budget Homes brand in February, selling about 250 of 263 apartments in 10 days for its first project in Mumbai, said Hari Prakash Pandey, senior vice president of finance and investor relations. Banks are also rushing to get a piece of the action. More than 16 mortgage financiers started operating in the country in the two years to last June and banks are expanding to offer loans as way to boost capital and offset soured commercial loans. And borrowing rates have tumbled, dropping about 275 basis points in the past five years to about 8.5 percent, while government interest-rate subsidies mean homes costing between two million and 3.5 million rupees have become up to 15 percent cheaper, according to CLSA. 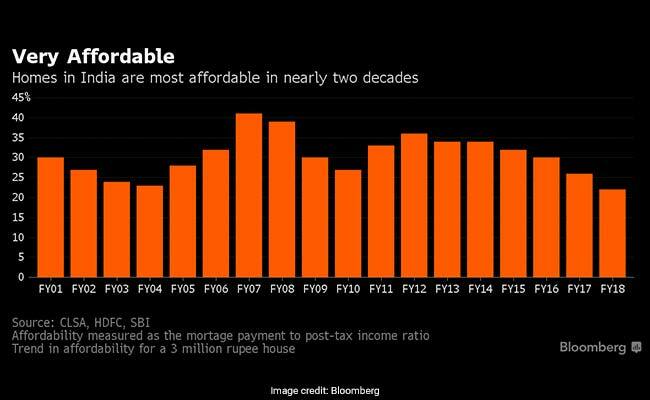 CLSA expects 60 million new homes to be built in India between 2018 and 2024, with social and affordable housing rising almost 70 percent to 10.5 million by 2024, exceeding the 33 percent increase in the premium market. The Yadavs realize they're reaching a space crunch at their current flat, said Pradeep. If, and when he gets married, he'll probably move out. "I'm not moving out of Palava, that's for sure," he said.